Burt Williams had an extraordinary intuition for crafting Pinot Noir. He was enamored with wine by his late teens, bought his first case of wine, a Pedroncelli Zinfandel at the age of 20, and made his first wine in 1964 at the age of 24 at his house in Forestville. The location of the house in “Hacienda Del Rio,” would grace the label of the first wines Williams crafted with neighbor, friend, partner and fellow winemaker Ed Selyem. When Burt and Ed started out in 1979, consistently fine California Pinot Noir was nowhere to be found. Blessed with a superb palate and possessing a self-taught keen understanding of how Pinot Noir should be crafted, Williams realized there was a place for world-class Pinot Noir in California, a “niche” for something that no one had ever done before. Williams read every book on wine and winemaking he could get his hands on and visited many local Russian River Valley winemakers who offered practical advice and encouragement. Burt attended many Burgundy tastings in the Bay Area, but never set foot in Burgundy because of his admitted reluctance to fly. The Williams Selyem Pinot Noirs had a powerful charisma that turned on many devoted followers. A customer wrote, “Please hurry up with your next release because I missed the last one and my friends have stopped coming over.” The quirky garagiste origins of the wines added to their mystique with their scarcity contributing to the appeal, but the truth was these were flat-out some of the greatest California Pinot Noirs of their time. The wines even appeared on restaurant lists in Burgundy! Williams was forever humbled by the public’s attraction to his wines. He was encouraged that consumers enjoyed his wines, but was more concerned with making wines that pleased himself. Williams Selyem was sold in 1998 and Burt was asked to consult for a few years after the sale, but he could never put his heart in it and soon left permanently. The last vintage he vinified at Williams Selyem was 1997. After the winery was sold, Burt bought a 40-acre property in Anderson Valley and planted 13 acres of Pinot Noir at what was named Morning Dew Ranch. He crafted two vintages from this vineyard, 2008 and 2009, and then retired completely from winemaking. Ed Selyem was an equal partner in Williams Selyem and although he did much of the business accounting and management, and came up with the idea of allocating the wines through a mailing list, he was also involved in the winemaking. Since selling the winery, he has shunned the limelight and press, and cherished his retirement. Fortunately, the wines of Williams Selyem have continued to offer remarkable longevity, and well-cellared examples are still drinking beautifully. The legacy continues. 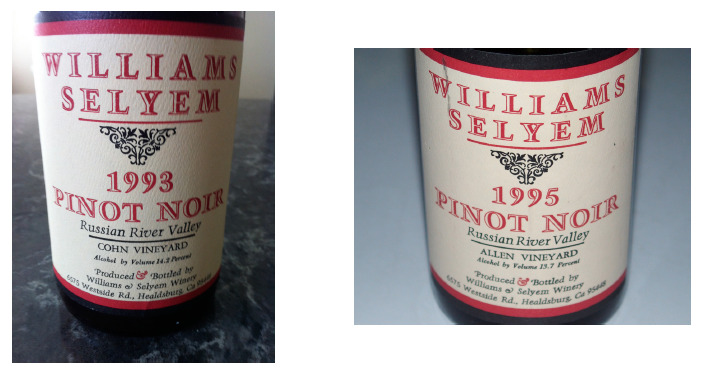 Recently I had the good fortune to drink two older vintages of Williams Selyem Pinot Noir: 1993 Williams Selyem Cohn Vineyard Sonoma County Pinot Noir and 1995 Williams Selyem Allen Vineyard Russian River Valley Pinot Noir. Cohn Vineyard, now an estate vineyard of Benovia Winery, entered Burt’s radar through a winemaker friend at Hop Kiln Winery that was sourcing grapes from Cohn Vineyard beginning in 1981. When the Hop Kiln Winery contract expired in 1987, Williams Selyem began sourcing grapes from Cohn Vineyard, usually blending them into the Russian River Valley and Sonoma County bottlings. A vineyard designated Cohn Vineyard Pinot Noir was produced in only two vintages: 1988 and 1993. Burt dropped the vineyard in 1995 when owner Arne Cohn put in drip irrigation and over-watered the vineyard. I was able to acquire a pristine bottle of 1993 Cohn Vineyard Pinot Noir from a collector and recently shared it with winemakers Michael Sullivan of Benovia Winery and Rod Berglund of Joseph Swan Vineyards. The wine had astonishing freshness and color, infused with aromas of incense, spice, Bing cherry and rose petal that held up for an hour while the bottle was consumed. Tasted blind, it would have been impossible to identify this wine as 23 years old. The balance was impeccable, the oak thoroughly immersed, and the tannins gossamer in nature. It was without doubt one of the greatest, if not the greatest, old California Pinot Noir I have ever tasted in over 40 years of tasting Pinot Noir. Grape sources were critical for the success of Williams Selyem and Allen Vineyard become one of the cornerstone sources of Pinot Noir for the winery. Since Burt and Ed had spent a significant part of their lives in the Russian River Valley, they knew where the good vineyards were located. 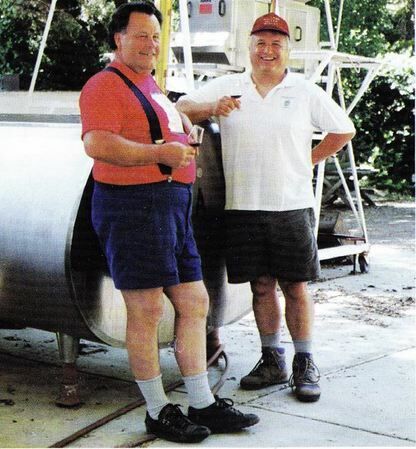 In 1987, Joe Rochioli introduced Burt and Ed to Howard Allen who owned a vineyard farmed by Joe Rochioli that was located directly across from Rochioli Vineyard on Westside Road. Not every vineyard met Williams Selyem’s high standards and only the best were deemed able to stand on their own as a vineyard designate. Allen Vineyard was consistently one of the favored vineyards in the Williams Selyem vineyard designate program. The 1995 Williams Selyem Allen Vineyard Pinot Noir that I opened recently was a delight. The color had turned a brickish red and was hazy (unfiltered). Upon opening, aromas of spice, leather, woodland and cherry zoomed from the glass, but faded over time. The wine was still fascinating to drink, offering ever changing nuances of flavor including cherry, strawberry, orange-infused cranberry, orange pekoe tea, and brown spice. At 13.7% alcohol, the wine was easy to drink, with resolved tannins and a sappy richness still persisting on a surprisingly long finish. Not epiphanic like the Cohn bottling, but still engaging. More examples of aged Williams Selyem Pinot Noir were reviewed in 2014 here: www.princeofpinot.com/ article/1487/.